Boulder may be small, but it is mighty. My own research demonstrates that Boulder is a major outlier among American cities when taking into account population size: it has the highest density of technology startups in the country (by a long shot) and it has the second highest concentration of venture capital dollars invested behind the San Francisco-Silicon Valley region. This research is a few years old, but more recent figures confirm the trend. As the chart above shows, when adjusting for city population size, Boulder has more than 10 times the average for the entire United States—second only to San Francisco-Silicon Valley, which has about 20 times the US overall. 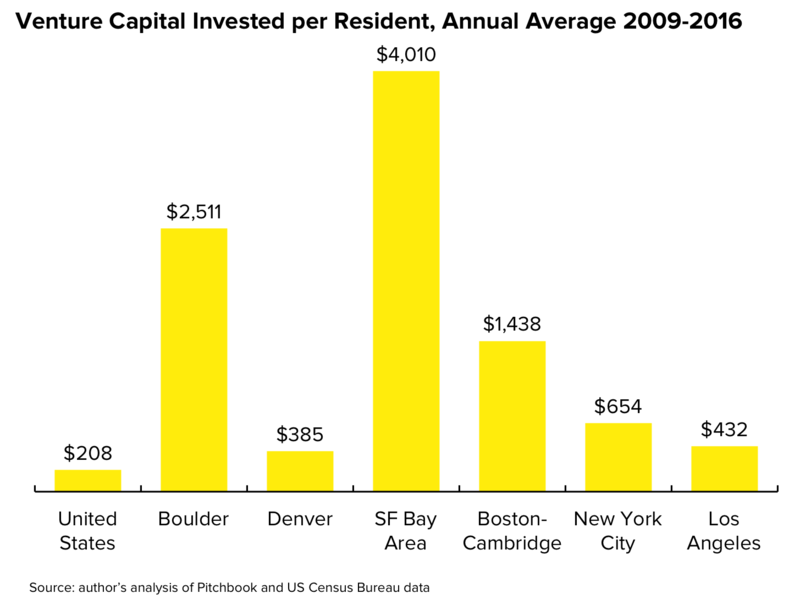 Boulder’s venture capital investment per resident far exceeds that of Boston-Cambridge, New York City, and Los Angeles. Critics may suggest that per-capita figures are misleading, and that what really matters is critical mass. It is true that Boulder is small—with approximately 108,000 residents in the city itself, and about 322,000 in the broader metropolitan area, it is most similar in size to South Bend and Green Bay. 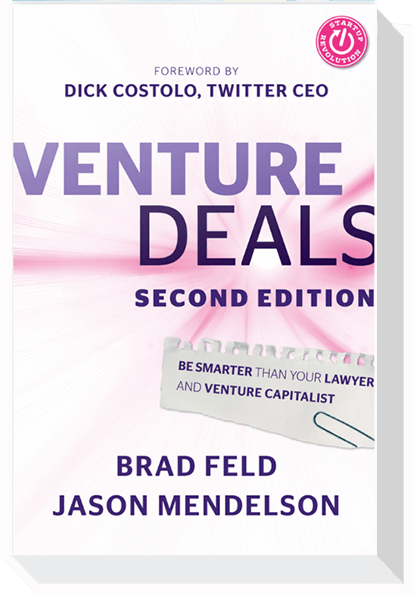 And, in absolute terms, Boulder accounted for just 1.2 percent of total venture capital invested in the United States between 2009-2016. By comparison, Denver’s contribution was 1.6 percent and San Francisco-Silicon Valley’s was 40 percent. But, Boulder’s undeniable successes dispel those critiques. Google and Twitter acquired local startups SketchUp and Gnip, and both maintain sizable (and growing) outposts here. Biotech firms Clovis Oncology and Nivalis Therapeutics each raised north of $100M in capital on their way to public listings on the NASDAQ. SendGrid was founded in Boulder in 2009, and although the company moved headquarters to Denver last year, most of its growth—the company employs around 400 people today—occurred in Boulder. And that’s just the tip of the iceberg. So, what makes Boulder so special? To start with, Boulder has some obvious natural advantages. It is a beautiful place to live, has copious amounts of sunshine, and a vibe that attracts people who are active, mobile, and educated. It has a major research university and hosts an array of public and private R&D facilities. Historically, Boulder has boasted flagship companies in data storage, pharmaceuticals, and natural foods, which spawned a number of startups in these areas. However, many places have some or all of those resources, yet lag behind Boulder. 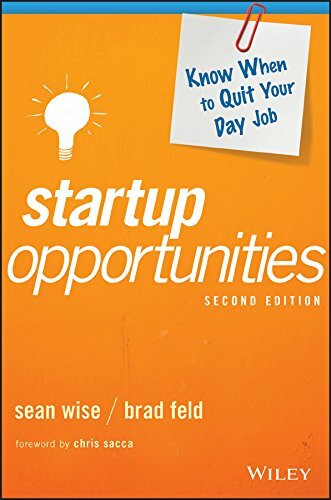 In fact, research has shown that the average relationship (correlation) between these factors and local high-tech or high-growth startup activity is tenuous—cities that are startup hubs have most or all of these qualities, but not all cities that have most or all of these qualities are startup hubs. 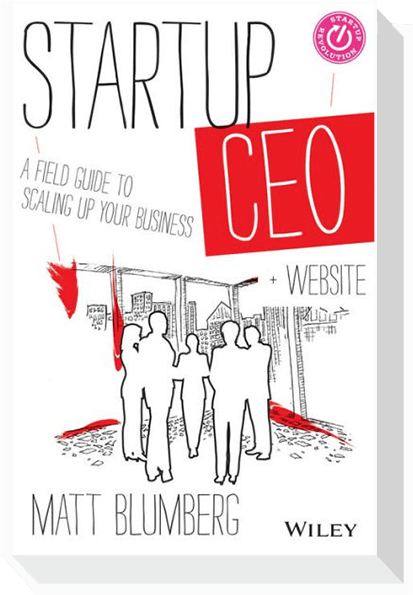 In other words, these “assets,” as I will call them, are necessary but not sufficient conditions for a dynamic startup ecosystem. If it’s not hard assets that make the difference, then what does? In her seminal work, Regional Advantage: Culture and Competition in Silicon Valley and Route 128, AnnaLee Saxenian demonstrated that the differentiating factor for Silicon Valley’s success was culture. 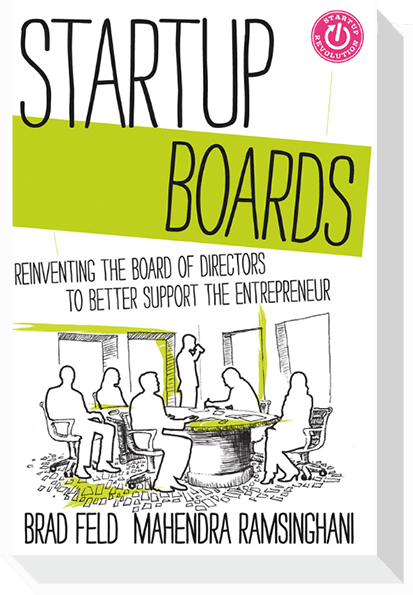 Silicon Valley firms and institutions had porous boundaries, engineers and entrepreneurs cooperated in a system that valued technological progress over firm identity, and the region embodied a flat, network-based approach to innovation and “collaborative competition.” It wasn’t just the quantity nor the quality of individual actors in Silicon Valley that decided its fate—though both were necessary—but instead, it was the way in which they engaged with each other and with the system as a whole that made the difference. 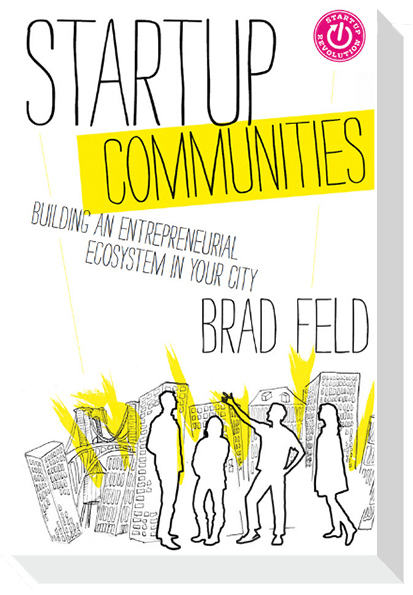 Brad’s 2012 book Startup Communities: Building an Entrepreneurial Ecosystem in Your City, which this blog is largely a dedication to, is also fundamentally about culture and approach. 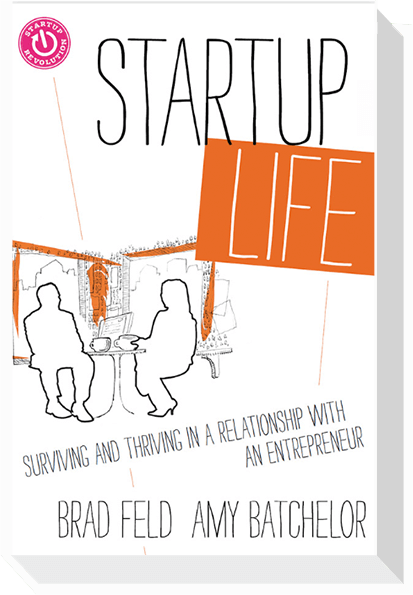 It describes the attitude of the startup community in Boulder, drawing broader lessons for other regions to learn from. Among these are inclusiveness, playing positive-sum games, being mentorship driven, having porous boundaries, and giving before you get, along with others. I’m only a few of days in, but I can already see something is special here. Boulder may look like a small city (~108K residents), and it may act like a small city (people are very friendly and open), but it doesn’t feel like a small city—at least not like the small cities I have known. Boulder is an unmistakably vibrant place, with an army of smart, enthusiastic people doing interesting things, and having fun along the way. Ok, but what’s this got to do with coffee? After two days of driving to get here—some of it through poor, mountainous weather—my dog and I were a little on edge. To make matters worse, we had a bizarre run-in with a giant, angry cat upon arrival that left her quite shaken. Frankie is a very sensitive soul, and this series of events—the travel, the new environment, and the cat from hell—left her even more clingy to me than ever. Saturday morning rolled around and I needed my coffee. The house I’m renting was empty of rations, so I ventured out to the local java establishment. Dogs are very much welcomed outside, as could easily be seen by the array of them on the sidewalk (one local said to me, “Welcome to the West Pearl Dog Park!”), but forbidden from going inside. Fair enough. But Frankie wasn’t having it. She was not ok with any sort of separation between us. How the hell was I going to get my coffee without further traumatizing her? That’s when the community kicked in. Two tables of complete strangers sprung into action, offering to care for my distressed dog, putting her at ease so that I could grab a cup of joe. As these, and other valiant efforts failed, one kind neighbor emerged from inside, extending to me a hot cup of coffee, a sugar-laden pastry, and a warm smile. A chair was gently pushed out from one of the tables and Frankie and I were invited to join in Saturday morning conversation, as if we had done so many times before. What became immediately obvious to me is that these people—a diverse bunch—know each other very well. They all live in the immediate neighborhood, had done so for many years, and they interacted frequently at their favorite neighborhood meetup. And yet, here they were, immediately welcoming a stranger into their world, sharing ideas and insights about the place they call home. It was all there right in front of me, what I had come to learn about, contribute to, and be a part of—a community of established “leaders”, who were inclusive, cooperative, playing a positive sum game, giving before they received, and mentoring a newcomer. It was what I had heard about, but was experiencing first-hand in a totally unexpected way—which in my experience, is how some of the deepest learnings occur. Things unfolded as they needed to, and I’m looking forward to the adventure ahead. I do it with eyes open, ready for my opportunity to pay it forward… as one does in a community. Since I’m new, I’d love to get in touch. If you’re local and want to meetup, you can find me on Twitter or via email. Thanks in advance for the warm welcome. And, let me know how I can be of help.